The Law of Attraction usually requires that you take some form of action to make your dream a reality. The action you want to take is an inspired action. It could be buying a book…making a phone call…taking a different way home from work. I don't know what action you'll need to take to make your dream come true, but you usually have to do something. It may be big or small. 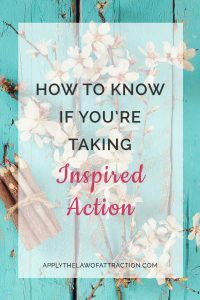 So how do you know if an action is an inspired action? Inspired action comes from an internal nudge to do something. You have an internal desire to do something. For example, something tells you that you have to call your friend, Mary. You don't know why you need to call her. But something is urging you to pick up the phone. Following through on that urge may help you manifest your desire. She might have the item you want. She might know someone you need to talk to who will help you achieve your goal. Inspired action isn't a plan of action. It isn't something you think about ahead of time where you create a list of steps to take to making your dream a reality. Following such a plan may not get you anywhere. The plan may even be hard to follow. But if you stop and listen for the Universe to guide you, to give you that internal direction, and follow through on that guidance, you might find yourself achieving your goal easier and faster than you expected. You might even feel as if a miracle occurred. Ego-based thoughts stem from lower-level feelings, like anger, loneliness, greed, guilt, desperation, hopelessness, jealousy, and fear. Any actions that stem from these feelings are ego-based actions, not inspired actions. Let me give you an example from an email someone sent me. It's a very common scenario. I have a feeling that I should contact her somehow, write a letter or sms. On the other hand something tells me that I should wait with it or at least I should wait for her contacting me since she already knows about my feelings and it would be her step that should be the next. Maybe it’s just my human impatience which I could not completely cast off of course that wants to do something to feel that the things are really moving, or could it be an inspired action what the Universe sent me telling to act? Here are some ways you can look at this scenario to tell if contacting her is inspired action. You can apply them to your own situation too. 1. He needs to look at what is motivating him to contact her. Is it fear? Is it loneliness? Is his ego trying to make things happen between them? If so, contacting her isn’t inspired action. 2. He needs to ask himself if he has thought about what will happen when he contacts her. Is he looking for a specific response from her? If he is, it isn't inspired action. 4. He's being given an internal nudge that he should wait. His intuition is telling him that contacting her isn’t inspired action. Often, inspired action occurs when you are following your heart and doing what makes you happy. It’s a response to situations when you are being yourself and not trying to control anything. If you really have the feeling of being and having your desire in the moment you think of taking an action, you are taking inspired action. If it doesn't feel exciting, don't do it. If you feel nervous, don't do it. If it's outside of your comfort zone, don't do it. If you want to get back at someone, don't do it. If you're trying to “make things happen”, don't do it. You'll achieve much more success, more quickly, if you take inspired action with the Law of Attraction. I felt really really good about it yesterday, and was detached and believed he would respond. I even said “I create my reality and this is what is going to happen. He has already said this to me, thank you.” I’m still waiting on a response. I guess my question would be……was the action I took inspired action? I felt like it was, but maybe it really was just me trying to “make something happen.” I did not really have any qualms about it when I sent it…but because I haven’t received a response from him I’m starting to doubt. Of course. Is it possible to manifest those visualized responses from him? I’ve been working really hard on EFT…doing it 3 times a day and have felt LOADS better and seen a lot of results…..but I am a little worried now that I may have set myself back yesterday. I’m sorry this was so lengthy. As always, thank you. Inspired actions occur when you already feel good. You don’t take inspired actions because you’ll feel better after you take them. You already feel good. If you’re taking an action to make you feel better, it isn’t inspired; it’s ego-based. While it would be wonderful to have him tell you all of these things, you have to be willing to feel wonderful on your own even if he never says those things to you. Right now, you’re focusing on the details, not on the final outcome. If you want a relationship with him, focus on the relationship. Everything that needs to happen for you to have that relationship will occur. If you want an apology, focus on the apology, but realize that an apology may not bring you everything you want. Great article! I have what I think is an inspired action here. I am in a relationship that I am manifesting getting married. My guy has a tendency to not text/call me back sometimes. Usually I have texted/called him every day whether or not he gets back in touch with me. Obviously he is comfortable and figures I will just contact him irregardless of if he gets back to me or whatever. I feel good unworried and such. But for awhile I have had the feeling when he does that just wait let him miss you a bit and text you back. Every time it happens I feel like instead of getting in touch with him the following day, I need to just sit back and wait for him to get in touch with me. Like that is the action I need to take in order for things to progress, him to miss me a bit and such. Does this sound like an inspired action? I am not trying to get back at him, or get a certain reaction out of him. It just feels like an internal nudge saying hey let him miss you, wait for him to get in touch with you. Thank you. It may be. You could try it and see what happens. I disagree that just because something is not “inspired action” does not mean you shouldn’t do it. In certain cases, I need to tell people how I feel for ME, so I can be at peace with myself by getting stuff off my chest instead of keeping it bottled up. So, you mean any efforts and works (something like studying!) is a kind of resistance because it feels that we don’t have that situation or dream already? For example, I study a lot for my university entrance. When I study, I know because I’m not in that university now, I have to study. In the other hand, you said about inspired action! For example maybe studying hard is a nudge from universe (I say God) to get there. How can these things mix together? I didn’t say he shouldn’t do it because it says he’s not with her. I said if he’s doing it because he isn’t with her, meaning his motivation is the fact that he’s not with her and he’s approaching it from the point of not having the relationship. It all comes down to the reason why he’s contacting her. What is his motivation? Why is he doing it? Is he coming from a place of lack or a place of having? Is he contacting her because he believes they are together or is he coming from a place of lack, fear, neediness, etc.? It’s fine to study for the University. The Law of Attraction usually requires action so studying can be seen as action that pre-paves your path to help bring you what you want. You can still hold the belief that you are in the University already. Studying can be a nudge from the Universe/God that you need to study to get there. Even with studying, you need to look at your feelings when using the Law of Attraction. Are you studying because you’re scared? If so, being scared may have an impact on your success, no matter how much you study. It’s a sign of resistance that you need to resolve. It doesn’t mean you should stop studying. It’s just a sign that you have an area of resistance to work on. I decided to think like this: Because I am studying in that university right now, I have to become a bookworm! So I am studying NOW in a way of practicing for my university in the next year. Is it a correct form of using LOA? That’s a good way of doing it. I bought both of your books over the weekend and devoured it. There are times in the manifestation process where I don’t know what action to take. A part of me wants to take action. Desperately wants to take action, but I know that deep down, that it is a form of ‘draggy action’. Definitely not inspired. What should I do then? Simply wait, and laze around, until I am inspired? Did you read this post? It answers your question. Don’t do anything until you’re inspired. If you still aren’t sure, read the post.